Humor me and let me tell you about a little dream I had last night. I was somewhere, at a well-known crafty event, and thee Ali Edwards was there. For some reason, I was able to approach her and actually get to talk with her, and she was interested in the conversation. We chatted about her exquisite and fun stamp designs and then all of a sudden I blurted out: Well, Ms. Edwards, let me show you some of my stamp designs. Her eyes lit up and she looked at me with awe. Fast forward a year and here I was, manufacturing my own line of stamps and paper products...and the best part...barely being able to keep up with the demand of my line. We all are allowed to dream, right? CAS-ual Fridays has this most amazing challenge going on: Toot Your Own Horn and it is all about creating a project inspired by your own blog header. It was fun to see the amazing samples from the design team, and extra special because a few of the members chose me to design their blog headers! So I couldn't pass up on the challenge and created a card inspired by my header. 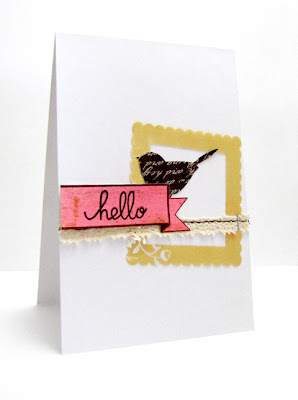 My latest design was a mix of my card making style: clean and simple with a few shabby elements thrown in. 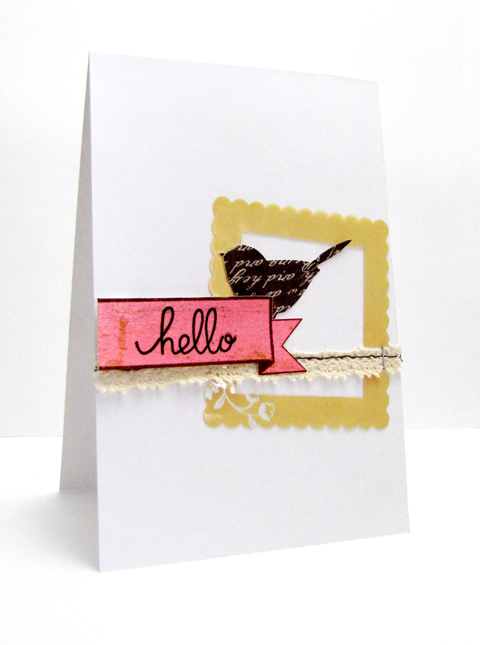 I have the tan frame, a bird, the lace border stitched to the card and secured with a staple and a pink banner. Head on over to the May Arts Blog this weekend and comment on the announcement of the Royal Ribbonista team for your chance to win four free spools of May Arts Ribbon, your choice (just make sure you follow the directions from The Ribbon Lady)! September is a good month to have a birthday. There's a group of gals gathering together today to wish Laurel a happy birthday! (For a complete listing, see Lynnette's blog.) I hope you have a very happy birthday Laurel, and many, many more. You are talented and so sweet! Tomorrow we celebrate my baby's sixth birthday, I can't believe how fast the time has just slipped away! Owls are often depicted as mentors and teachers, but I love how in Winnie the Poo, he is scatterbrained and just plain funny, but still smart. Sometimes I thinkthat is the perfect description of me! 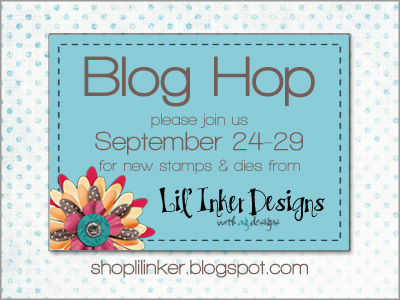 Today is the last day of the new release Blog Hop for Lil' Inker Designs! 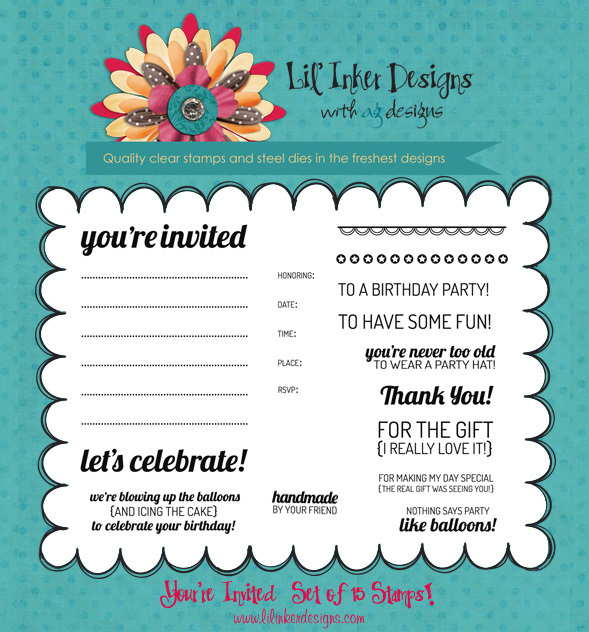 You should have arrived from Jen Del Muro's Blog. 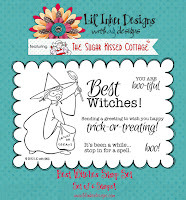 I made a fun little card that features many Lil' Inker Designs products, to showcase how well everything goes together! 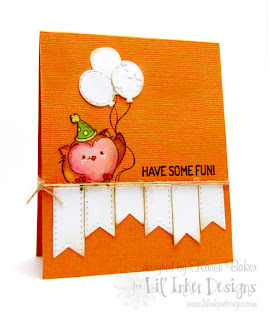 I started by coloring and fussy cutting the owl of Birthday Owl from last month's release of the 2 Cute Ink line, then I stamped him onto a folded piece of orange cardstock minus the balloons and adhered my colored owl to the card base. I then die cut some balloons from Balloons Dies and added them, as well as banners from Stitched Sentiment Flags and the regular Sentiment Flag Dies. Each of these were adhered to the card and then I wrapped it with some May Arts burlap string. 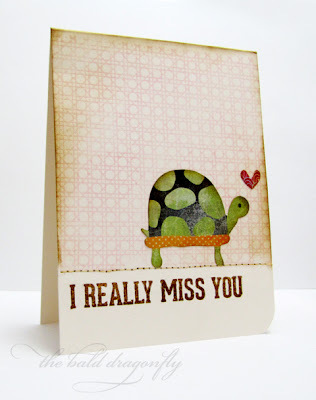 I finished the card with a sentiment from You're Invited! Your next stop is the talented Emily! And remember...there are secret prizes along the hop so leave a comment on each stop to better your chance of winning! When the boys were little, my oldest wanted to be Draculus (that is Cole for Dracula) in the worst way for Halloween. My mother, with her exceptional sewing abilities, made him a fancy black cape lined with red and a high collar. Honestly, he looked like a mini version of the real thing. Not to be outdone, though, she also made some cute little bat wings and ears for my baby, who was two at the time, so Draculus could have an entourage! Can I brag and say that they had the best Halloween costumes in the whole town? Hasn't the Lil' Inker Designs release been just amazing? Today marks the fourth day of design team examples, and there is a hop to showcase them all. You should have arrived from Alyssa's Blog. 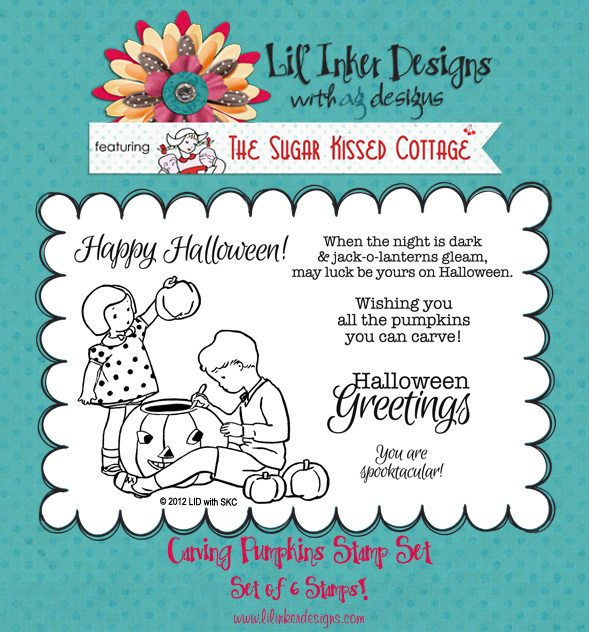 I am lucky to feature the two other sets from Lil' Inker's Sugar Kissed Cottage Line today. 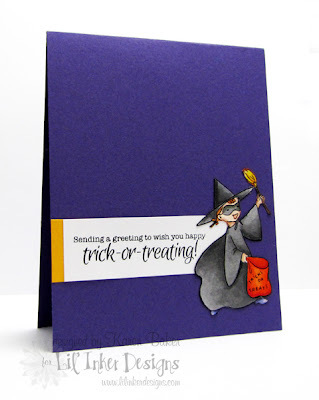 The above card uses the vintage image and sentiment from Best Witches. I colored her with markers, trimmed her out and created a clean and simple card around her! These will be so easy to whip up and send out to many friends for Halloween! Next up is a card that features the sweet Carving Pumpkins set. 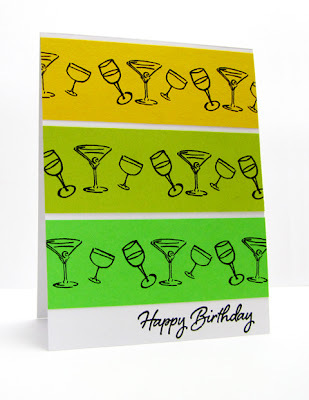 This too, would be easy for mass production, because I simply stamped the image, colored and fussy cut it out and adhered it to a sleek white card base that had been simply embellished with a few strips of patterned paper and a fun sentiment from the set. I'm the last on the hop, but please check out the store and check out these sets for yourself! And remember...there are secret prizes along the hop so leave a comment on each stop to better your chance of winning! Life's work: Helping shape my boys into being the best they can be and loving them beyond belief. Supporting my husband in his decisions and being by his side. Making sound choices that have my parents still be proud of their baby girl. Being the best mother, wife, daughter, sister, friend, co-worker that I can be. In a nutshell, that is my life's work. 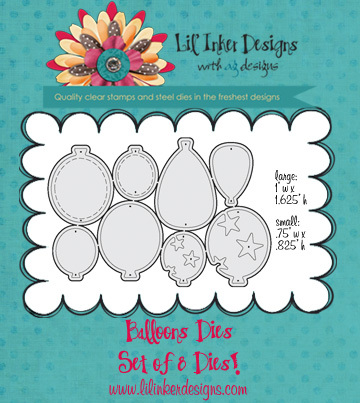 It's time for another Skipping Stones Design Sketch Challenge, you can find the details of the challenge, see fabulous design team samples, and learn about the rules and prize over on the Skipping Stones Design Blog. We are featuring the Grunge sets this month and I used the tried and true and absolutely spectacular Grunge 1, plus I added a touch of Breathtaking Butterflies, Garden Kiss, and Sentiment Frames as well! Please join us with your take on this challenge! Two years into marriage, I remember purchasing a turkey breast for a special Thanksgiving dinner for my husband and I. Not a whole turkey where I'd be too frightened to cook it and not the turkey lunch meat we usually got, but a compromise. I remember feeling icky that Thanksgiving evening (our first born would arrive just one month later) so in the freezer it went. Sometime around mid-January I excitedly prepared the turkey breast and a few fixing and just as I pulled this gorgeous looking mini-turkey out of the oven, we got a knock on our door. It was the neighbors coming by for a visit to see the baby. I put the turkey back in the oven to keep it warm so we could have a short, social visit. By the time the guests left, the turkey and the fixins were cold... That is my version of the origination of cold turkey. 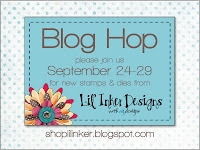 Such a fun week this will be as Lil' Inker Designs has a whole slew of new, amazing products debuting. 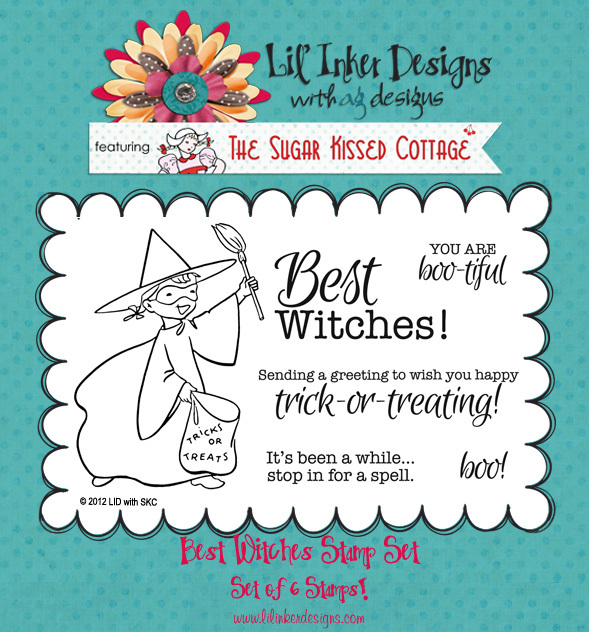 If you are following the Blog Hop, you should have arrived from Laura N.'s Blog, otherwise you can start at the beginning here! There are hidden prizes along the hop, so please be sure to comment on every stop for your chance to win! 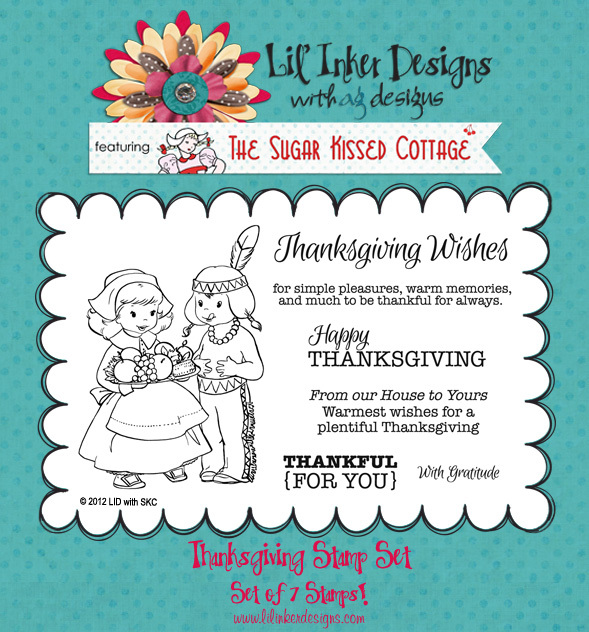 My first card to show today, the one above, uses the cute Thanksgiving Wishes set that features a Sugar Kissed Cottage images and a few corresponding sentiments that I got to design. I colored the image with marker and lightly brushed everything with some distress ink. 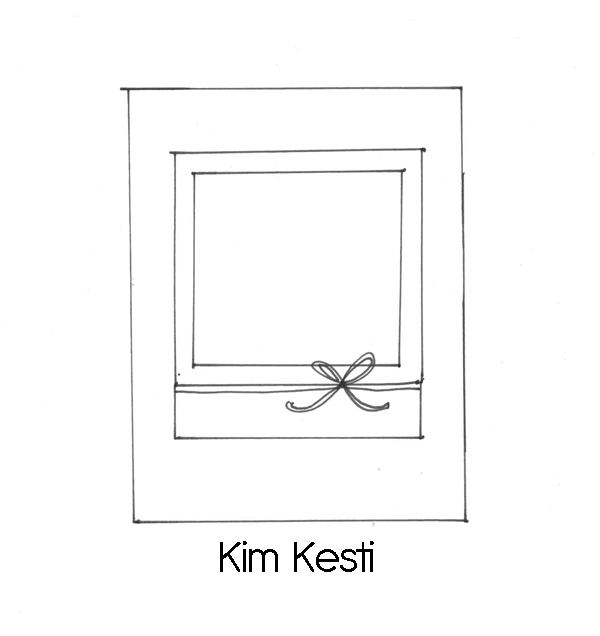 The background is from the interior Textured Frame and the sentiment has been trimmed out with the Sentiment Flag. 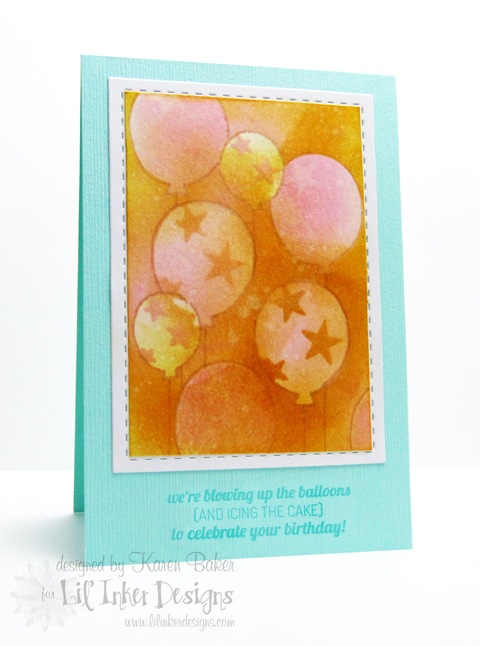 This next card features the new fabulous die set, Balloons and a corresponding sentiment stamp set, You're Invited (that I designed!)! 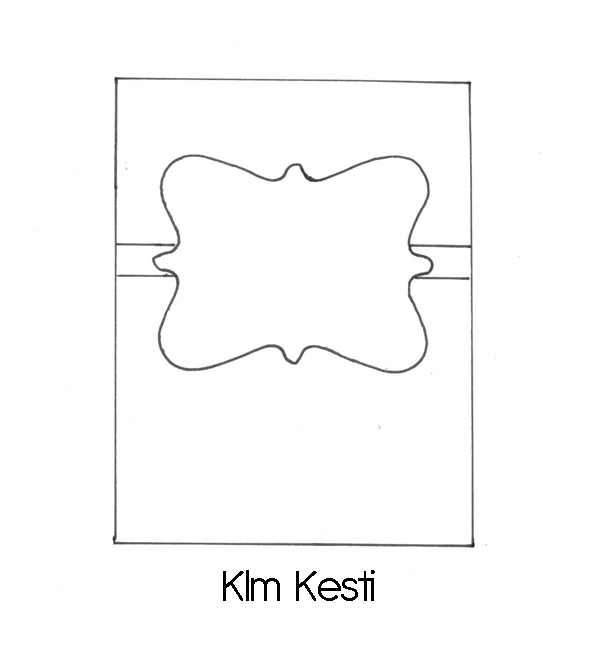 Lil' Inker Designs really has such fun dies with cute details, but this die is something I've never seen before. 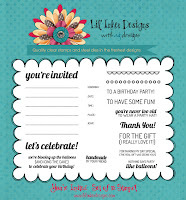 You have the capability to create custom designs with a "punch out" die! I used the dies as a masking tool on this card. I told you, right?! 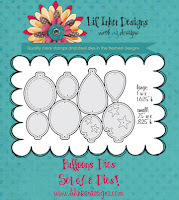 So many amazing products debuting this month from Lil' Inker Designs! Remember, for more inspiration and your chance to win, hop along and comment! Your next stop is Mary Johnson's Blog! My boys are infatuated with this movie called Master of Disguise. It is full of children's slapstick humor, and every once in a while, I find myself chuckling as well (hmm...perhaps not after the fifteenth time of viewing it, though.) There is a scene where the gentleman disguises himself with a bald cap and a giant turtle suit, and well, it is just funny, trust me! 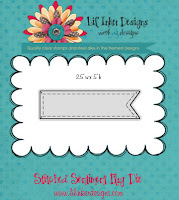 I had the extreme pleasure to guest design for Market Street Stamps this month. 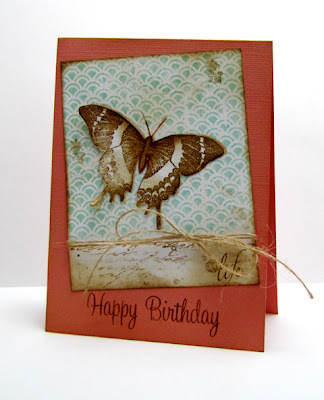 Market Street Stamps offer some of the most amazing and unique background stamps, it is what first drew me in! 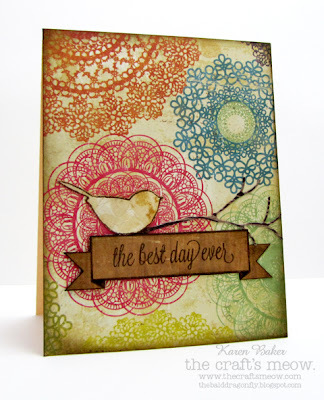 I paired a couple of these background stamps with the fun, bold sentiment stamps from Great Big Greetings and a few older chipboard embellishments for my cards today. 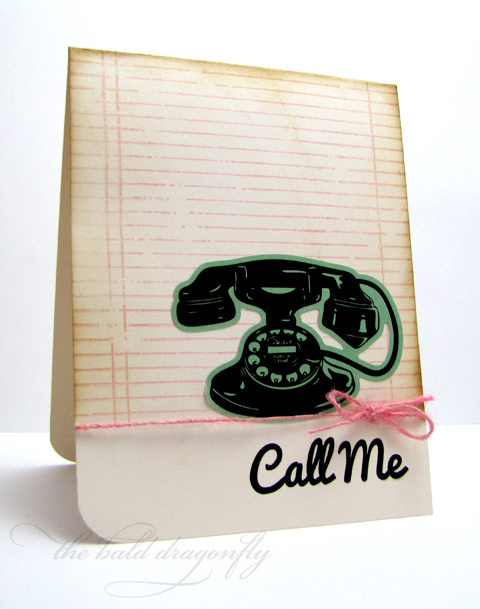 This first card uses the background stamp Vintage Notepad stamped in pink, a chipboard phone and the fun Call Me sentiment. I finished the card with some burlap string tied in a bow and a rounded corner-this card is perfect for mailing! This next card uses the Cane background stamp also stamped in pink, a chipboard turtle and heart and the poignant I Really Miss You sentiment. 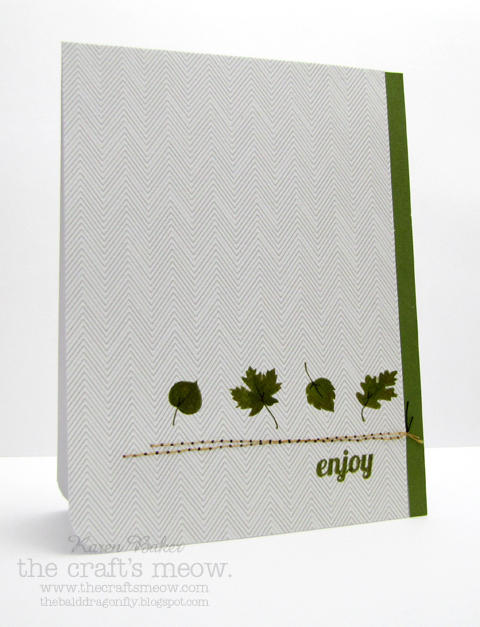 I finished this card with some stitching and a rounded corner as well, another card perfect for mailing. 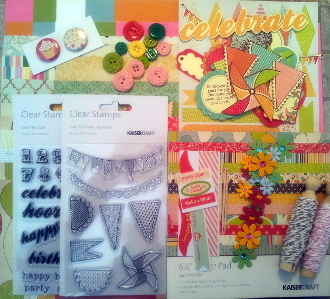 I can tell I'm going to have a great time trying out other combinations of Market Street background stamps and the sentiments from Great Big Greetings, it will also give me a chance to use up some of the chipboard shapes or stickers I've been hoarding! 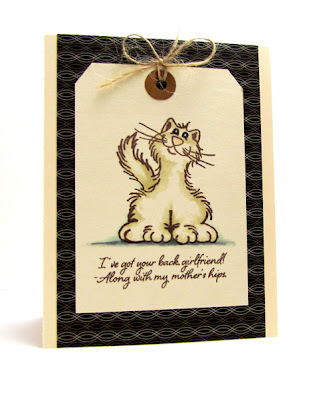 Welcome to The Craft's Meow's September Release Blog Hop! 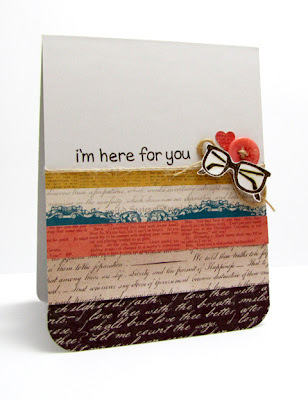 You should have arrived from Julie Ranae's blog, or you can start at the beginning over at The Craft's Meow! The in-laws are celebrating their 50th wedding anniversary next year, and "the kids" are already in full planning mode. We have to proceed with caution though, as they are not the big party type people however we want their day to be extra special. Any suggestions? I stamped the scallop pattern directly onto the card base and then embossed it, as well as onto a piece of gold tissue paper which was then fussy cut. 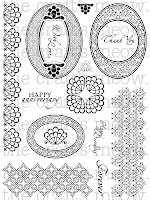 I embossed another of the patterns included in Lovely Ovals and trimmed it out. 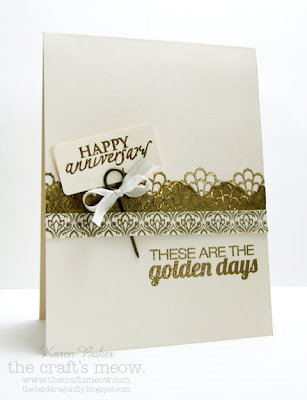 To finish the card, I embossed two sentiments, the larger one from Golden Days directly onto the card base as well, and the Anniversary from Lovely Ovals onto a trimmed piece of cardstock. 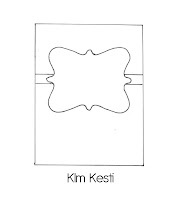 This was attached with a pin that has a been tied with a bow. Speaking of embossing, I'm going to link this up to Simon Says Stamp Challenge: Embossing! So glad that you stopped by today to help celebrate this month's release! You can be eligible to win all six new sets from The Craft's Meow by visiting and making a unique comment on each design team member's blog. The deadline to comment is 9:00 pm PDT, on Sunday, September 23rd. Your next stop on the hop is Lindsay Amrhein! The situation: a mouse comes out and decides to play, much to the mama’s dismay (a scream or two might be involved). The words exchanged: From the small boy: Can we keep the mouse? Don’t worry mama, he can live in my pockets. Then: From the big boy: How can the mouse fit in your pocket with all the spiders you keep in there? 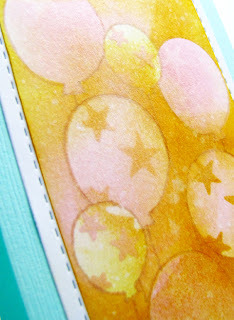 Over on the Artful Delight Blog I have a quick tips and tricks post on a different way to use washi tape. A roll of this really fun pattern from October Afternoon was included in the September Card Kit...I had to put it to good use! 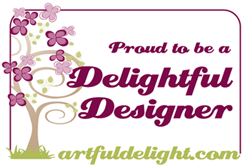 I hope that you have a minute or two to stop over at Artful Delight to check it out! And while you are there, check out the sketch challenges! 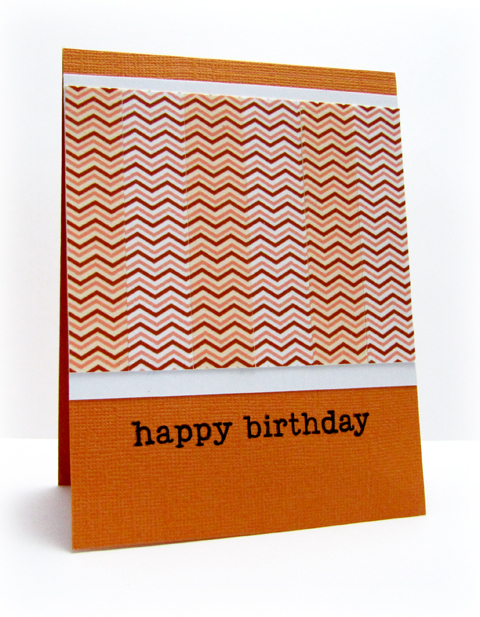 There is just a few days left to participate in a layout or card sketch for your chance to win a free kit! 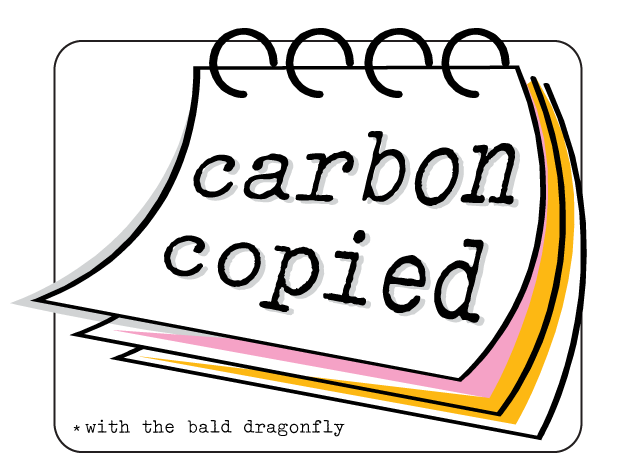 So happy that Carbon Copied is back! 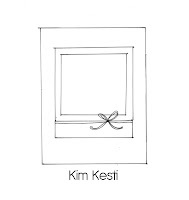 (If you are unfamiliar with this fun little adventure, click the badge on my sidebar or click here --->) I thoroughly enjoy working with every designer, the emails going back and forth to choose our favorite sets that we have in common, to pick a grand challenge that we love and then to schedule a post on the same day. Today I have the extreme pleasure to work with Laurel, from Paper Crafts by Laurel! Gosh, she is just a sweetie, so talented, and I adore watching her videos (I live vicariously through her haul videos!) We both are showcasing Clear to See by Lawn Fawn and participating in the Lawnscaping Challenge, a challenge Laurel founded and nurtured for it to become a success and one of my favorite challenges around! 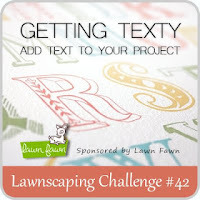 This time around Lawnscaping is asking for participants to use text in their projects. 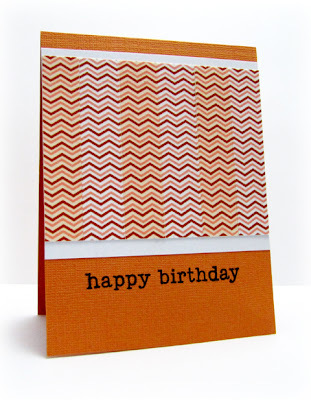 I chose a few various text themed paper in different shades and styles, cut them in strips and then adhered them to the card base. I grabbed a sentiment from Lawn Fawn's On the Mend Set, because I thought it was a perfect compliment for the handmade embellishment of glasses from Clear to See (I'm calling them reading glasses today! So many ladies at my work utilize these little treasures and half the time I think they'd be lost without them!) A button, some May Arts Burlap String and a punched heart finish the look. The glasses do have a touch of glossy accents for the lenses. Please be sure to stop by Laurel's Blog to see her take on the Lawnscaping project using Clear to See by Lawn Fawn! Day by day, vivid green hues slowly turn to yellow and then bright orange, possibly with a touch of red or crimson. The air is cooler, the jackets and jeans emerge...These are the golden days, the golden days of fall. A sparse time here in Wisconsin to enjoy, as soon those pesky white flakes will fall. 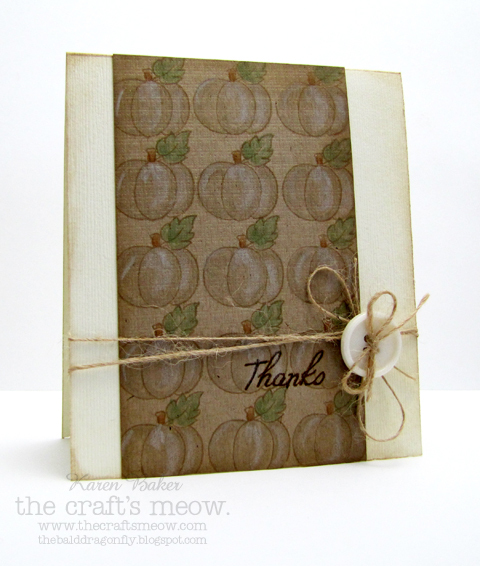 I'm delighted to be showcasing a fall set that I designed for The Craft's Meow, Golden Days. The set features larger leaves with a fun detail, but today I'm featuring the small leaves included in the set, and straying away from that golden palette to show how diverse this set can be! I simply stamped a series of leaves onto patterned paper, drew in the veins and stitched a few lines to ground them and the sentiment. Kaitlyn Ord also has a fun set debuting this month, called Good Times. This set is absolutely perfect for Project Life, and for cards! 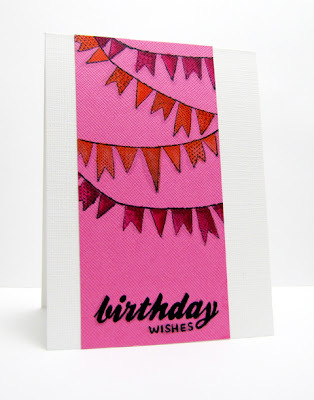 I stamped the banner from the set onto patterned paper and then added one of the many unique sentiments from the set as well. The banner was then adhered to some patterned paper and a die cut bird and branch came to rest on it for some additional interest. The Craft's Meow is featuring all the sets for the September Release this week. 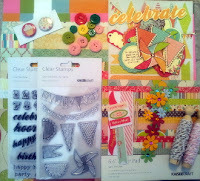 Be sure to stop by the blog to comment for your chance to win these two sets! I can't wait to get my hands on some white pumpkins this year, I think they are so elegant! 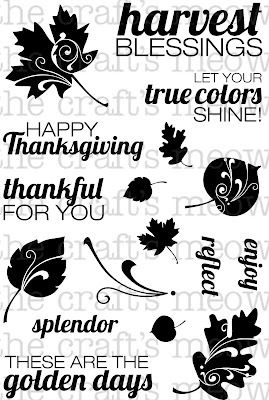 Today marks the debut of Mabelle's two sets for The Craft's Meow, Fall with Fibi & Lilly and Fall Blessings. 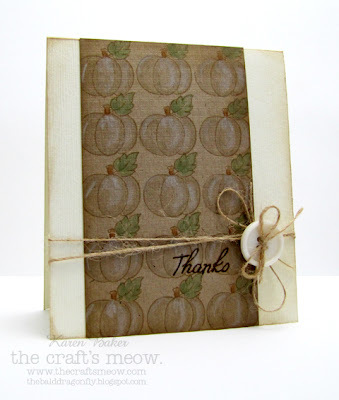 My white pumpkin card features the really fun pumpkin image and sentiment from Fall with Fibi & Lilly, along with a button and May Arts burlap string. Fibi and Lilly are pretty cute in this set too! 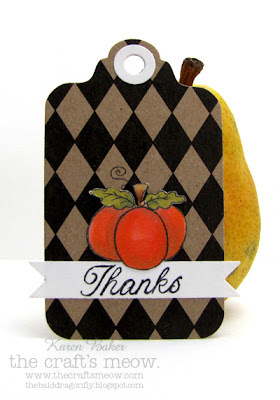 This tag features some patterned paper and the big pumpkin from Fall Blessings, along with the sentiment from the same set. The images in these two stamp sets are absolutely perfect for paper piecing or coloring! The Craft's Meow is featuring all the sets for the September Release this week.Be sure to stop by the blog to comment for your chance to win these two sets. If you are in the mood to mosey on over to the May Arts Blog, I have some pretty dang awesome news that went up yesterday and there is still a chance to check it out and comment for your chance to win a REALLY huge prize, seriously, a REALLY great prize! Be sure to answer the question that the Ribbon Lady is asking when commenting! 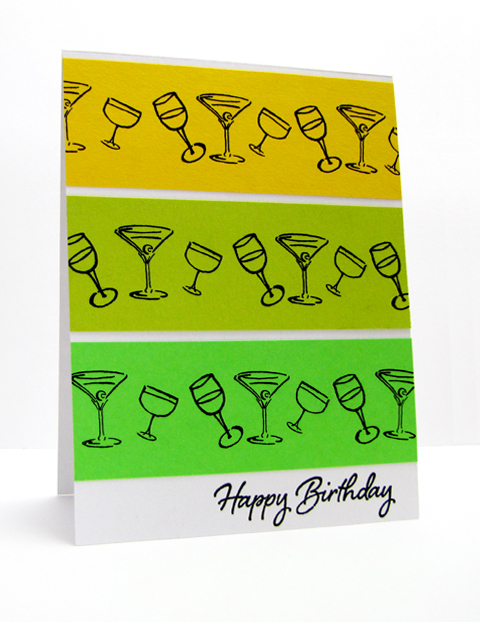 Skipping Stones Design released a new stamp set called Cheers! this week and wait until you see the hilarious sentiments in this set! 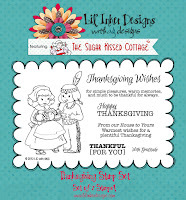 The designers are showcasing the set today with a blog hop-you should have arrived from the talented Judith, from Jay Gee's Nook! 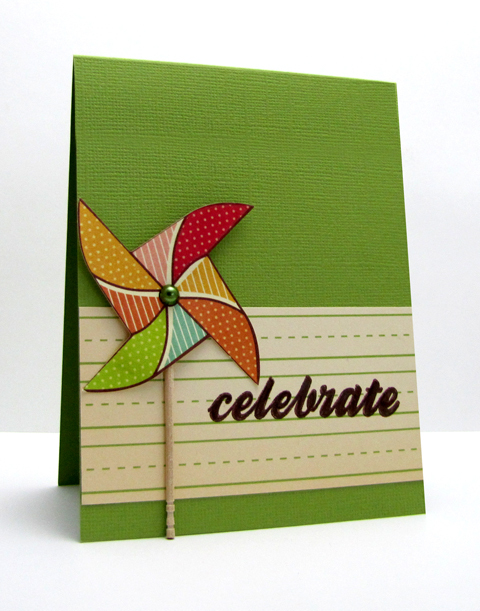 This card follows (loosely) the sketch for this week's Skipping Stones Design Sketch Challenge as well! Create a project for the challenge, or hop along today for your chance to win a free set! Your next stop on the hop is one of Skipping Stones Design's newest design team members, Megan! We've got another The Craft's Meow beauty that we are showcasing today, Lovely Labels designed by Elizabeta. This set too, is simply amazing. 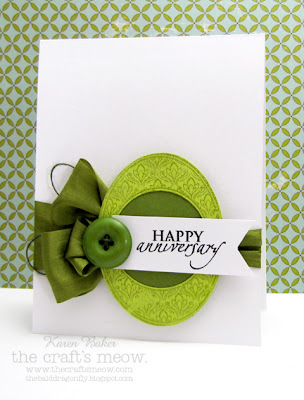 One of the labels have been embossed and fussy cut, I stamped a sentiment onto a banner and assembled the card with a bit of fine green silk ribbon from May Arts and a button. As a reminder, after a short, unexpected break, The Craft's Meow is coming back with a bang to showcase sets from the September Release, we'll have showcases each day this week! 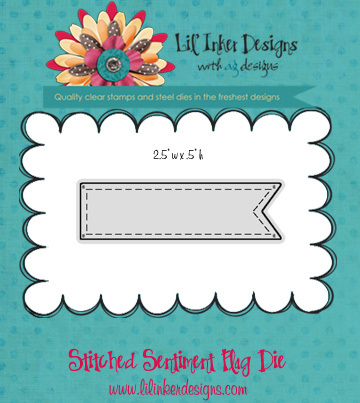 Be sure to stop by the blog to comment for your chance to win Lovely Labels.